I watched this again last night before commenting on it. Bearing in mind that you I shouldn't judge this episode without considering the second part too, I still think that this first part is too slow and talky. Loads and loads of exposition, (admittedly quite interesting exposition), and maybe it would have benefitted if John Schuck had been around to play Draal, but it seems to be waiting to pack everything into the second episode. Still, its great to see Sinclair (although his costume is rubbish) and Zathras, and the message from the future is pretty ominous. But, a part of me wishes that we could have seen that great battle for real, based on the scene in Babylon Squared. The SFX are pretty good though- has the White Star looked better than in this episode? The bits in the future on Centauri Prime are the best parts. In a sense, that matters to the five year storyline more than the Sinclair/Valen plot does. War Without End almost feels like an aside to the main plot that has been building up throughout the season. JMS said that he found these the most difficult episodes of the season to write, and it shows a little bit. Still, it does have one of the best time-travel plots seen on TV even if the execution isn't that perfect in my mind, and I'm looking forward to going back and watching the second part tonight. I'd give this first part a B-. I'm always a bit surprised when I hear people lament B5's lack of battles. B5 was always about so much more than space explosions and special effects. You can remove all of the effects, as far as I'm concerned, and these would still make fantastically interesting episodes. While I love a great space battle, I appreciate what you say. But the battle that we glimpsed in Babylon Squared seemed to be the battle to end all battles, and what was important about it was that our characters, and the station itself, were in the thick of it. In terms of storytelling and characterisation it could have been a really rich story to tell, much like the battle in Severed Dreams, which was memorable because of the emotional intensity. For instance, it seemed to be the culmination of Garibaldi's story-arc (of course, his story went down a different path, happilly for him). And, when we first saw that scene in Babylon Squared, we had no idea who they were fighting, and the mystery added to the scene. Plus, what we saw in Babylon Squared looked like nothing I've ever seen on TV since. It would have been really epic! Instead, it amounted to nothing more than a dream. Ah, well, that's what happens when you muck about with time. Even in B², it was pretty clear to me that they were losing that battle. The shadow invasion and destruction of B5 were NOT something that was meant to turn into reality. It might've been a hell of a thing to watch, but it also would have meant that almost all of our characters are dead. Wow, so few posts for such a momentous episode?! This is one that I remember vividly from the first time I saw the series on TV. I love Sinclair's dramatic entrance in the scene, a hooded, mysterious stranger at first. His new title and Marcus calling him "Ranger One" show us that he transcends his ambassadorial role. And his reputation for enigmatic utterances, described by Marcus, is very amusing. Oh, and have you noticed - whenever Delenn makes an entrance on the show, Minbari-typical music plays, a few notes on the harp. The same or similar music lets us know that we are on Minbar in those scenes. I also like the look into the Great Machine - and of course, Zathras! Hard to choose which of his quotes are best; "Zathras not understand but Zathras do" reminds me of Lennier's statement to Delenn when arriving on the station, about obedience, not understanding, being necessary. Interesting effect in the changed colours of the scene when the bomb explodes. "Hello old friend", "goodbye old friend"... What a great way to bring Sinclair back!! Last edited by Estelyn; September 17th 10 at 22:48. I can't help but wonder if the computer changeover didn't lose some posts, but I don't recall it doing so. I may have just forgotten, too. 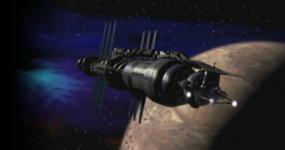 Yes, to me this is the episode that "makes" Babylon 5. It is daring, surprising (everyone wakes up to the "solution" at a different moment, but it isn't something you can predict in the first ten minutes of the episode. Other than "Waiting for Gesthemene" [sorry, I never could spell that name], these are my favorite episodes. It has been a walk down memory lane watching your posts, by the way. I may soon have to rewatch it again, myself. Maybe I'll do a B5 marathon over the Winter break.